You can use DSN connection strings and DSN-less connection strings for your connections. [DataSourceName] is the DSN that you are using for the connection. You can set additional configuration options by appending key-value pairs to the connection string. Configuration options that are passed in using a connection string take precedence over configuration options that are set in the DSN. [ClusterName] is the name of the ZooKeeper cluster to which you are connecting. [DomainName] is the fully qualified domain name of the Drill server host. [PortNumber] is the number of the TCP port that the Drill server uses to listen for client connections. [Server] is the IP address or host name of the Drill server to which you are connecting. [ServiceName] is the Kerberos service principal name of the Drill server. [YourPassword] is the password corresponding to your user name. [YourUserName] is the user name that you use to access the Drill server. To test the ODBC connection on Linux use the test utilities in the samples directory of the driver manager installation: iodbctest and iodbctestw. Use iodbctest to test how your driver works with an ANSI application. Use iodbctestw to test how your driver works with a Unicode application. There are 32-bit and 64-bit installations of the iODBC driver manager available. If you have only one or the other installed, then the appropriate version of iodbctest (or iodbctestw) is available. However, if you have both 32- and 64-bit versions installed, then you need to be careful that you are running the version from the correct installation directory. See http://www.iodbc.org for further details on using the iODBC driver manager. In the samples directory of the driver manager installation, run iodbctest or iodbctestw. The prompt for an ODBC connection string appears. After the SQL> prompt appears, type quit;. Go to the Drill shell to run commands. Do not attempt to run SQL commands from this prompt. Start the iODBC Data Source Administrator app in /Applications. The iODBC Data Source Administrator dialog appears. 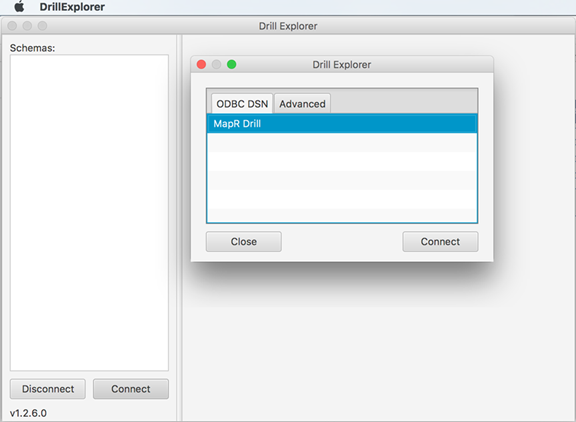 On the ODBC DSN tab, select MapR Drill. Click Test. 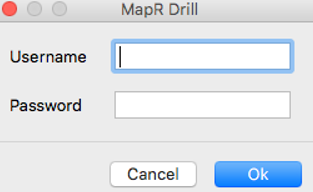 The MapR Drill login dialog appears. If you configured Plain (or Basic Authentication) in the .odbc.ini file, enter the user name and password you also configured. Otherwise, click OK. The success message displays. Follow instructions to configure the ODBC connection on Windows. 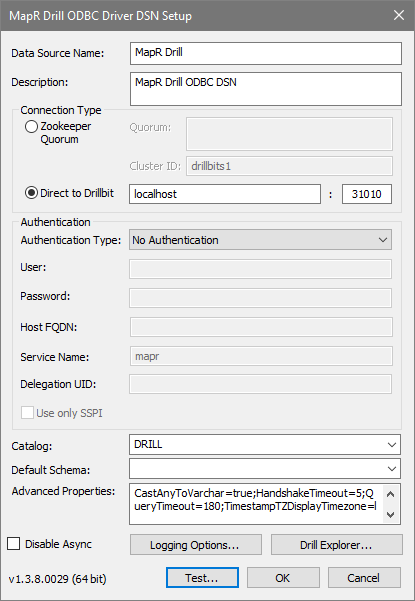 The MapR Drill ODBC Driver DSN Setup dialog is displayed. Click Test. A Test Results popup will display that states you have successfully connected to the data source.